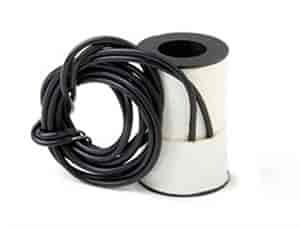 NOS nitrous solenoids are manufactured using a proprietary plunger material that resists swelling. Crafted with a strong stainless steel base, these solenoids are a staple in the high-performance market. The primary purpose of a solenoid is to act as a valve turning the nitrous and fuel on and off. Different sizes of solenoids are available depending on the amount of flow required. There are several ways of actuating the solenoids, but they should only be activated when the throttle is wide open; anything less than wide-open throttle will result in severe damage. Note: Do not use PTFE thread tape as it can damage the solenoid, only use a PTFE thread sealant paste to seal fittings.